After the Toy Fair, I asked the squadron of testers to look through the posts and to see if anything was interesting to them. It's not as if I get to test everything that I see at the Toy Fair but their reactions and interests would still be very valuable. I was so surprised to learn that there was one and only one common request by ALL of the testers' moms. Jenn, can you get us those knives? I don't know why I'm surprised. I checked out the knives at the Toy Fair and I was really impressed. And I don't consider myself to be extremely safety conscious either but when it comes to knives... I don't know... to me, it's more about respect than safety. Trying to get you a close look. If you are a neighbor, you are welcome to come over and try it out. Bring your own strawberries. I think professionals see kitchen tools a bit this way. If you have respect for the tool, you will best ensure your own safety thus your knife has to be able to cut! 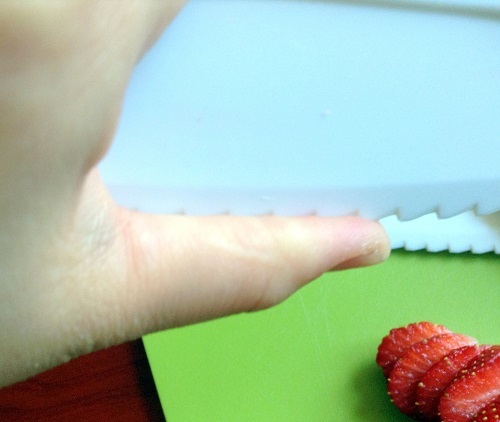 Dull knives could be more dangerous. In fact, when my mother retired and finally starting surfing the web, what was the first thing she bought with the Amazon gift card that I got her for Christmas? A knife sharpener! I kid you not! I come from a family that has spent hundreds of dollars on single knives so thus, when I saw that knife and I sensed it could cut and it was affordable and then I thought of my son's horrible appetite and then... well.... I didn't even wait to hear back from the company, I just went ahead and bought them on Amazon. I don't really tell my kids to do this but seriously, isn't this the coolest thing? Why didn't I wait? Did you see the video above? If not, see Number 1's video below. He's nine and I would be comfortable with my six year old doing it too but we just haven't started with him yet. Seriously, when you watch these videos, you'll see what I mean. 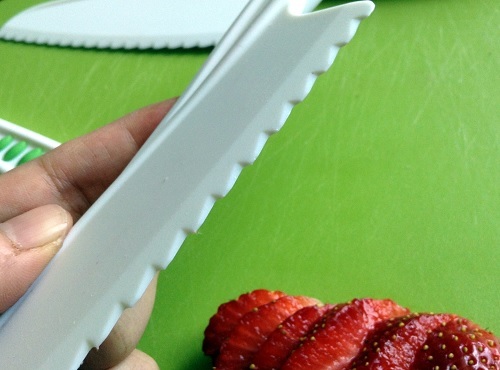 These knives really inspired me to finally bring my kids into the kitchen. 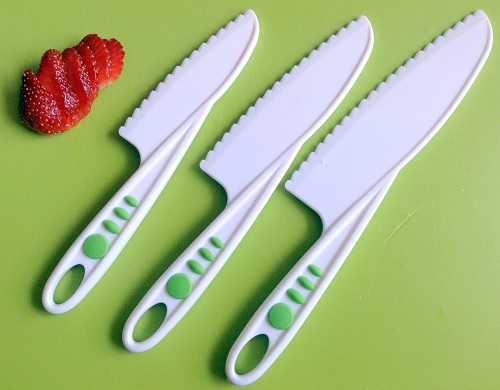 Their picky tastebuds really killed my interest in continuing my family's love affair with food but these three little knives have brought on a new inspiration and a bit of an appetite boost too! Thanks Curious Chef! And now here's your chance to win your very own set of knives! Just fill out the Rafflecopter form below! Last minute tip: If you are a household that turns the T.V. on during dinner because you feel like you just have to... I hear your pain. I have recently discovered that the Food Network inspired them to eat a little bit more! You never know! It's worth a shot! They make cooking and eating look like super duper fun! Right now, my kids like Chopped All-Stars. I haven't heard of this brand before, but I LOVE this. Cooking/baking/food prep are such great ways to tie in education across the curriculum and gross & fine motor skills. These knives "help me to do it myself" while giving the parent or teacher peace of mind re: safety. haven't heard of it before, but will look into it. I love this idea. Have to get these for my grandsons...they always want to help me in the kitchen!! !